Our designer blend will show you why everybody's so excited about sunflowers. You get singles and fluffy doubles. Some blooms are a hefty 8", some only 3". There are wine reds, rich golds, soft yellows, white chiffon and bicolor, too. They'll last 7 days in vase. Abundant blooms for well over 2 months! Attracts butterflies. Sunflower, Fun 'N Sun Blend is rated 4.5 out of 5 by 11. Rated 5 out of 5 by grower57 from Championship Ribbon! I grew these in 2016 and they were so beautiful that I entered one in the county fair. It's possibly the one in the lower left corner of the listing picture. The Master Gardeners said that my sunflower was the most perfect sunflower they'd ever seen - it looked almost like it wasn't real - and the judge awarded it Reserve Champion in the Horticulture Division even though I was unable to name the specific variety! 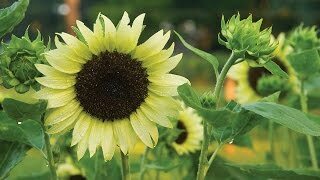 Rated 5 out of 5 by sunflowerlover from Quick bloomers Good germination and quick growth as seedlings. If you live in an area with rabbits, I suggest you start these in pots, and when they are a foot to 18 inches tall, transplant them into the ground. This is because rabbits love to eat these as seedlings or small plants, but once they are too tall for them to reach well, they will leave them alone. The variety which was quickest to grow (picture attached) looked like a regular sunflower, but had a nice bronze tint on the inside of the petals, which blended very well with the yellow. In my opinion, my picture does not do proper justice, as you can hardly see any bronze, but in person it is more prevalent. As long as you can keep rabbits away, expect beautiful blooms! Rated 5 out of 5 by floridacrazydaisy50 from sunflower hybrid mix colors These are great. Yellow flowers have bloomed, are now seeding so pedals are falling off, are short lived, but some of the yellows have double heads so are double blooming; these are beautiful. The colored sunflowers have big heads but have not bloomed yet. Very healthy looking and will bloom. Rated 5 out of 5 by Sunflowers from Container Sunflower 2011 I'm growing these in a container on a deck, so I don't quite get the full effect. Nonetheless, they are fun and easy to grow. Rated 5 out of 5 by Anonymous from Most gorgeous Sunflowers ever! Like the TITLE states ~ these are absolutely gorgeous Sunflowers! I am a newbie gardener and purchased these seeds last summer. They all came out so full and had tons of blooms. There were so many different varieties/colors/sizes, I had no idea. I have never took so many pictures of flowers in my life! HIGHLY RECOMMENDED! Rated 5 out of 5 by GardenGirl88 from Beautiful Flowers This was the first time I had ever planted sunflowers, and these performed very well. I had gorgeous blooms and plentiful seed heads for the birds. Some of the smaller flowers were great for flower arrangements. I am going to allow them more space in a different garden this year though. They had stalks like small trees and were a bit too robust for the veggie garden.